[OMAN] — Such a fascinating place, Oman, with the nicest people I’ve run into, across the board. 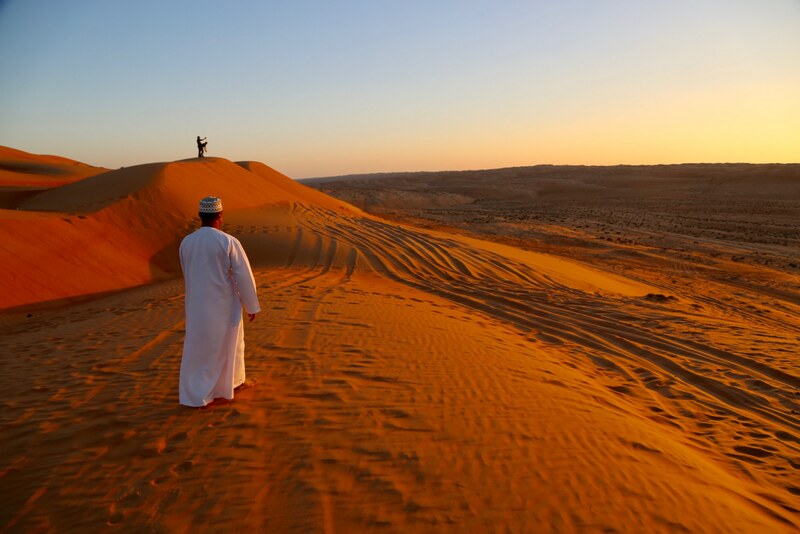 Omanis are known for their gentle souls, peacemaking and equal support of friend and foe. People are so nice that even when I arrived at Passport Control, I walked up to the stern looking passport-checker dude. I never saw anybody yelling, no shopkeepers haranguing in the street, no honking cars — in fact, you’ll get a ticket if you honk outside of an emergency warning. Oman is all about the geology. Some of the most amazing scenery I’ve ever seen. Dry as a bone in all but for a few spots in the southeast, near Salalah, in the toe of this Red Sox logo-shaped country. (Sorry Oman, I hate the Red Sox, but it works here). Unless you can get a direct flight from London or Frankfurt, you’ll probably fly into Dubai, then take the short 40 minute flight to Muscat, rest in luxury for a couple of days, then hop in a SUV to tour the rest. 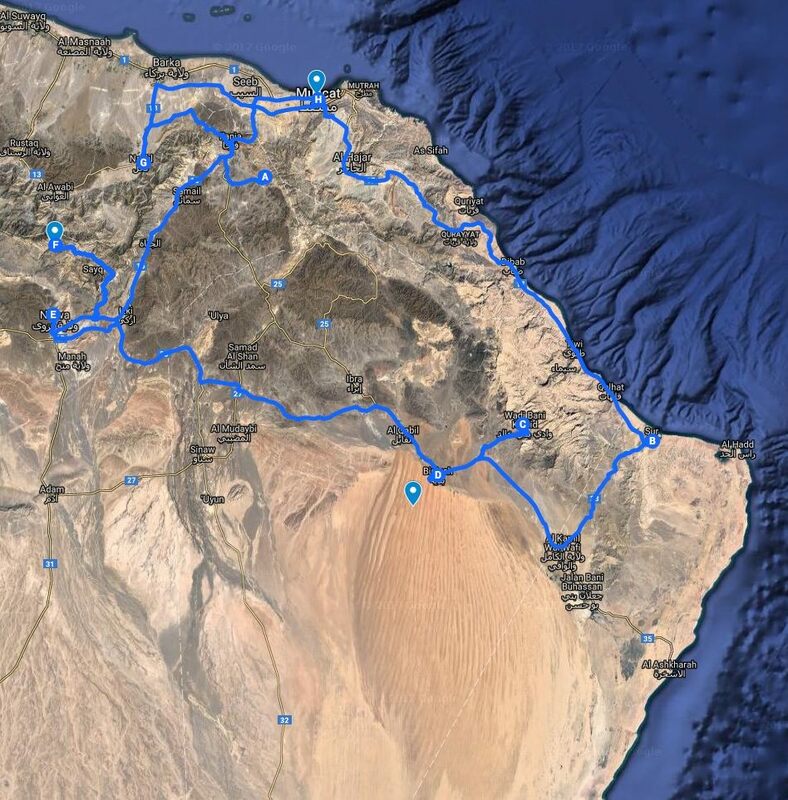 This post roughly follows the Great Circle Route of Northern Oman… the Tourist Trail, if you will, of this un-touristic country. Where you’ll seldom find any other tourists. I was there on a two week slog through the northern part of the country over the U.S. Thanksgiving 2017 holiday. There is so much to see, I barely scratched the surface of this rough part of the earth. So hang in there. Scroll and click on the galleries to open up bigger pictures and more details. Oman has everything. Mountains. Deserts. Canyons. Beaches. Ancient Cities. Amazing food. This post deals with just a few days of my two weeks. And follows the map below. At first it looks confusing but it’ll make sense as you scroll through the pictures and stories. You can click on this Google Map I made to zoom in on the details by clicking here. Bookmark it for when you go. Leaving the super clean Muscat — one of the cleanest and safest cities on the planet, ranked up there with Singapore — we drive an hour further down the barren eastern Omani coast — with its Mountain Dew-colored water contrasting the Root Beer colored mountains. 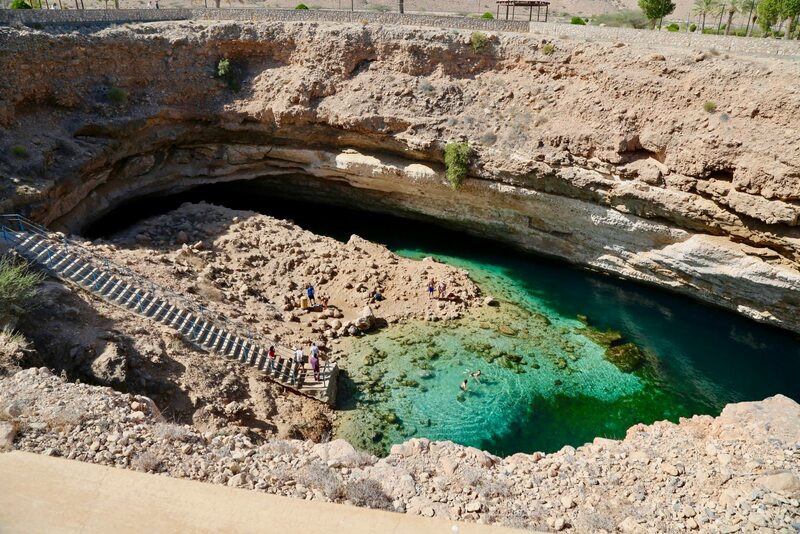 The first stop was BimmAh at the largest sinkhole in Oman. One giant Listerine colored yaw sunk into the ground, gargling with crystal clear water. It’s in a park along the coast, you walk the edges then follow the steep steps down into the cool earth. A few cars and tour buses in the parking lot. My guide Zubir whisked me past the front gate, greeting everyone like brothers. Bunches of German couples, finding their own way here. Germans have long discovered this great country; almost every guide says about 70% of their customers are German, followed distantly by some intrepid French and Italians and expats from Dubai. “You’re only my second American customer” three different guides tell me. The echoes and giggles of other swimmers bouncing off the walls. I hear it is jammed with families and groups on the Omani weekends (Fridays and Saturdays) but we were there on a Thursday and hardly anyone was there. So go off-peak. And bring your suit. There are a number of other cool wadis to explore along the coast — which, due to time, we didn’t have a chance to explore. Including Wadi Ash Shab, where you take a small boat across the water and then amble up the wadi to more and more pools tucked into the canyon. Further down the coast, about 45 mins through some dusty roads… and innumerable “sleeping policeman” speed bumps that plague the country… is the ancient port town of Sur. The ancient port of Sur. Omanis were known for centuries as the best ocean navigators, the best engineers and top boat builders — long before anyone else had figured that out. The dhow was their stock in trade. Sturdy and dependable as a swimming donkey, their triangle sails could be spotted all up and down the African and Indian coasts, hauling spices, treasures and spoils of war. And still are there today. Sur itself has its own charm, if properly cropped. The contrast of the electric green water and toothpaste white houses makes it look like it was squeezed from a brand new tube of Aquafresh. It’s stunning and looks more like Zanzibar, which makes sense since Omanis ran that country, too. Sur was the dhow-building capital for centuries, but now there’s just one shipyard left, with sturdy Indians now handling the craftwork, carving and shaping the wooden hulks and coaxing rough-hewn wood planks from Burma to fit their will. If you’re into boat-building, you can visit the last lone shipyard for free, walking unescorted amongst the scraping, drilling and hammering. Or, you can just look at my pictures and skip it all together and save a chunk of your time, which I would suggest; leave them alone to build their boats, and spend more time exploring wadis. Omanis were known for centuries as the best ocean navigators, the best engineers and top boat builders. The dow was their stock in trade. Sturdy and dependable as a swimming donkey, their triangle sails could be spotted all up and down the African and Indian coasts, hauling spices and treasures and spoils of war. The water, like everything in Oman, is crystal clear. Sur was the dow-building capital for centuries, but now there’s just one shipyard left, with sturdy Indians now handling the craftwork, carving and shaping the wooden hulks and coaxing rough-hewn wood planks from Burma to fit their will. If you’re into boat-building, you can visit the last lone shipyard for free, walking unescorted amongst the scraping, drilling and hammering. Or, you can just look at my pictures and skip it all together and save a chunk of your time, which I would suggest; leave them alone to build their boats, and spend more time exploring wadis. From Sur, you drive inland. Passing miles and miles of new highways and roads being built to upgrade the Omani infrastructure. Passing town after town that looks like this. Omani houses are distinct. As my guide Zubir tells me: “First you buy the land. Then you mark your plot with stacks of rocks at the corners. Then you build a concrete wall. Then you build your house. A walled compound (my favorite thing) with rooms for a whole family. A tower. And a terrace on the roof. 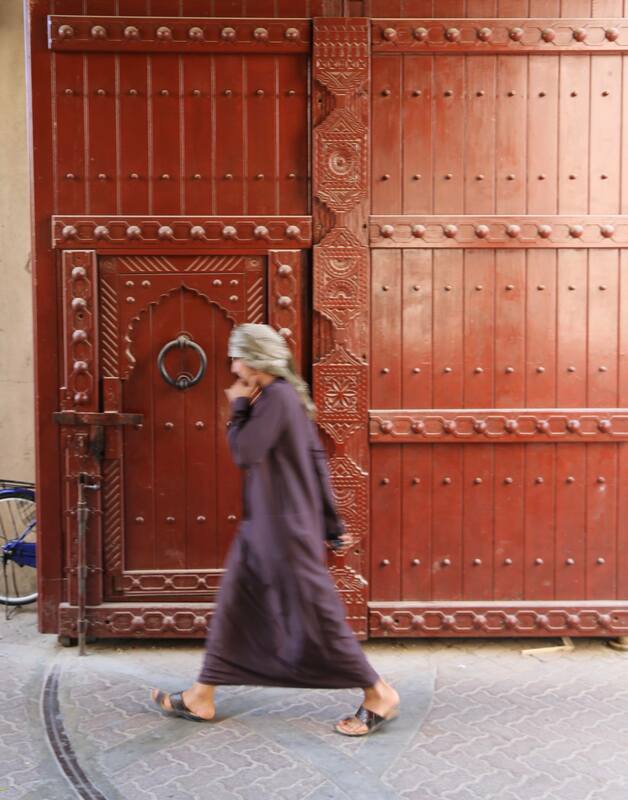 By law from the Sultan, all houses and buildings must be of Omani or Arabic design, using natural materials and design. 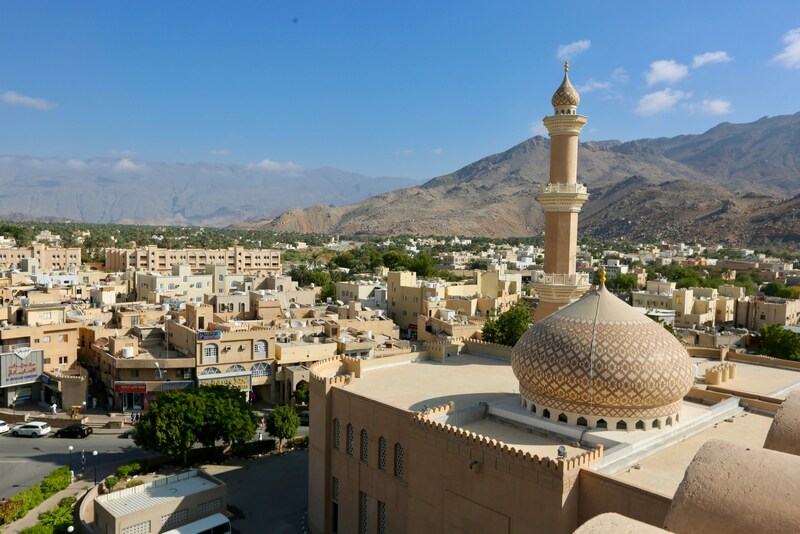 This is a typical Omani town. Set in a gorgeous landscape, the ever-present mountains as a backdrop. 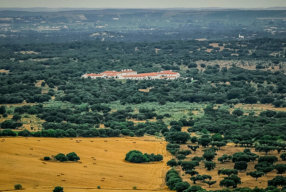 White houses, buildings and mosques, complemented by seas of lush green date palms. “Wadi” are all over the Middle East, the term means “valley”. Most times they are sandy canyons, dry as a bone, ready for a gully-washer rain to scrape them clean. 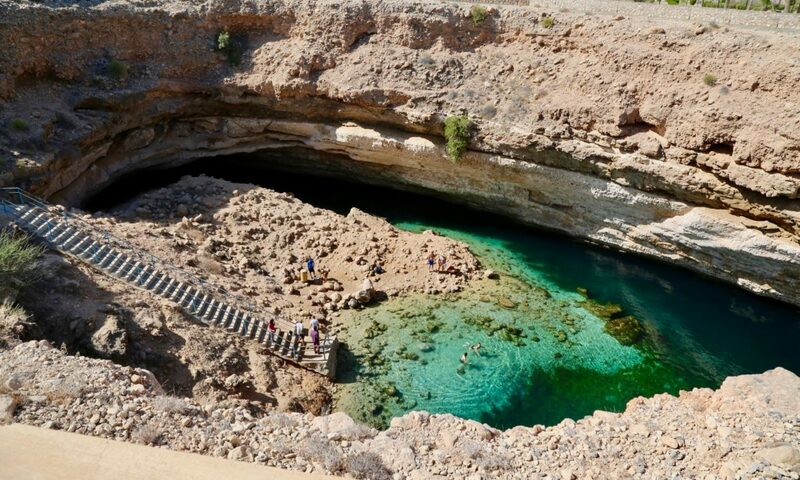 But wadis are particularly exceptional in Oman, especially along its eastern coast, where fresh mineral springs splurt like fountains, creating lush green oases and creeks lined with palm trees. Villages percolating up from the springs. Some of the wadis are super tight, with narrow chasms to shimmy through or water to wade through to get to the clear cool pools on the other side. On the way to Wadi Bani Khalid — one of the best wadis in Oman — You walk up the “falaj” irrigation ditches — which Oman figure out long before the Romans, thousands of years ago, which the Romans then spread throughout the world — and soon you enter into this bizarro world of pools and palms and curry and bridges and people of every dress and undress. You can swim in the first part, following a bouldery chasm with stair step pools up the canyon, up-up-up, until a cave at the top (which i didn’t make). The ankle-snapper rocks will make your feet hurt, so bring something more than flip flops. Many of these have well-organized setups to enhance the experience, with toilets, lifeguards, even small cafes rightthere. Wadi Bani Khalid is one of the biggest, and many say the best, wadi to explore, very accessible and the cafe had an awesome chicken biryani! Try to avoid Fridays and Saturdays when it’s Family Let-Out Time and the place is crawling with people.. Person in the upper left side used for scale. We got there too late in the day (3ish) due to losing valuable time at the  dow-building tour, so we lost the light to late day shadows. So go earlier in the day. And try to avoid Fridays and Saturdays when it’s Family Let-Out Time and the place is crawling with people.. Sorry, pictures aren’t very good due to sun dipping behind he mountains. But google it. This one looks like the movie set of the original OG 70s Planet of the Apes movies. You can swim in the first part, following a bouldery chasm with stair step pools up the canyon, upupup, until a cave at the top (which i didn’t make). The ankle-snapper rocks will make your feet hurt, so bring something more than flip flops. Because of the time pressure and being late in the day, I didn’t have time to enjoy this special place. Kicking myself. You’ll get used to this. This is what so many Omani towns look like. 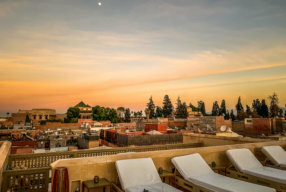 Set in an dramatic setting, with walled compound houses all built around a mosque or two. Or three. We were on a race against time, running out of daylight. 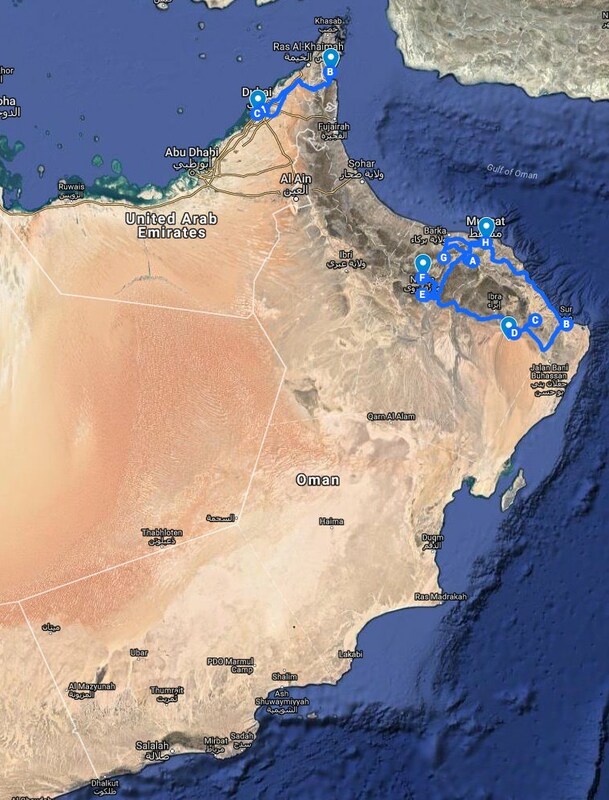 I had a well-laid out plan for my trip, a leisurely two week stroll through incredible Oman, nothing jammed packed or rushed But while everything was convenient to ME, what I did’t consider was other people had plans, too. I had planned to go to a private tent came in the Wahiba Sands desert for one night, then head up to the must-see city of Nizwa, where on Friday mornings only, they had an amazing goat and cattle auction. 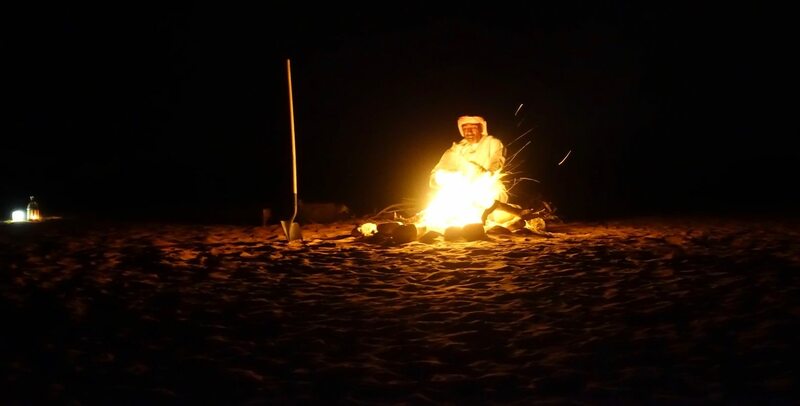 The idea was to sleep under the stars in the desert, swing by the Wadi Bani Khalid (in previous posts) and then shoot up and watch the auction. What I didn’t realize was in Oman (and most Muslim countries) Fridays are the most important day of the week and EVERYTHING shuts down for midday prayers by 11am. And besides the Goat Action, Nizwa had a cool souk and one of the coolest forts I’ve ever read about, Nizwa Fort. And Nizwa was at least two hours away. So much to do before 11am…. So my amazing guide Zubir had a plan, we’d hit the wadi in the afternoon on the way to the desert, then leave the desert at 5am to make it to Nizwa by 7am. But doing all that we were in a race to get to catch the dunes before sunset. As we pulled up to the Canvas Club Luxury Camping, the British manager of the camp, Sam, said I was too late for the sunset camel ride to camp through the dunes, it was only minutes before the sun sank. I was bummed. With that, Zubir firmly tightened his Omani cap, revved the Land Cruiser engine to 6,000 RPM and we took off straight up the dunes, cutting the two hour camel ride down to seconds. Near the top, I threw off my shoes and charged up the tallest dune, catching the last copper and blue hues before impatient Mr Sun flipped us off and disappeared over the horizon…. 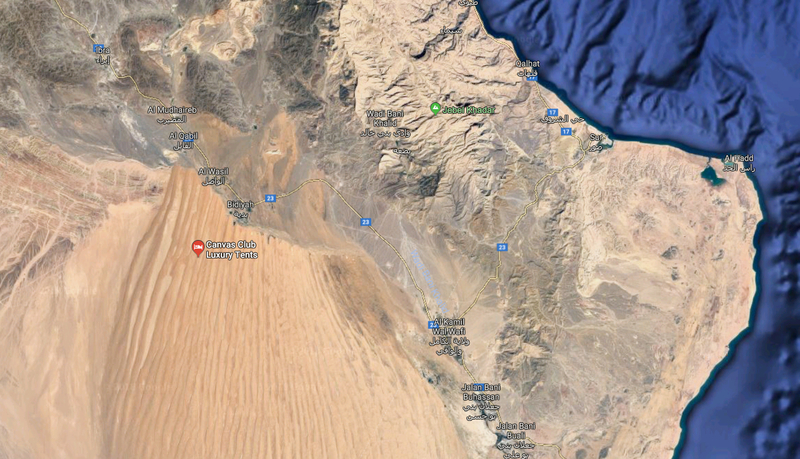 You can tell how radical the desert sands are compared to the mountainous northern part of Oman. You literally just drive until you can’t drive anymore. 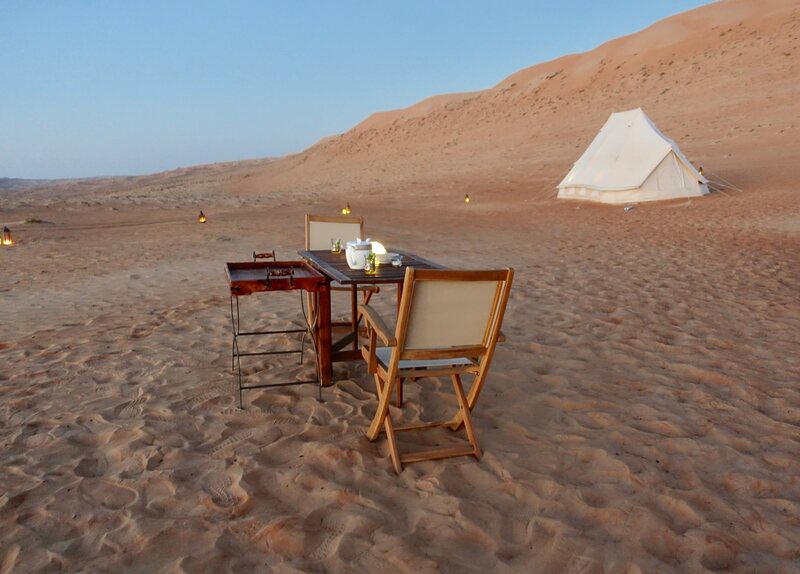 Like in Morocco, there are tons of tent camps you can stay in the desert in Oman. At all different price points. 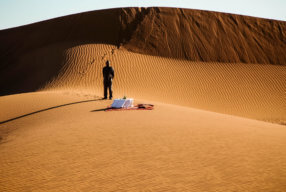 Most are permanent camps that are actually on the edge of the dunes vs. being right in the talcum powder sand. Some pretty rustic. Some a little gimmicky. 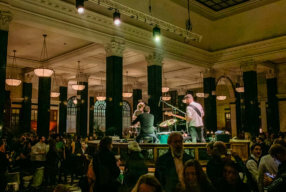 But my travel agent Louise Brooks at Scott Dunn Travel recommended a new upstart tent camp called Canvas Club Luxury Camping, a 3 year old German-based company. What makes them different is they reserve the camp just for your group, while the others can billet 20, 30 or 50 or more people. You have the whole posh camp to yourselves. Whether a family, or just one person, like me. They have fine-made tents from Belgium, kitted out with antique Omani Bedouin touches. But the ornate fabrics hide the posh beds and sheets underneath — the same beds as the Ritz-Carlton uses… out here in the middle of the desert! I slept like dead cat. You can read more and see more pictures of it in my other post here. The Friday Goat Market starts around 7am. Ends before midday prayers, then it all closes. You gotta get there early or you’ll miss it. I had to miss the desert sunrise to make it up here in time, waking to the stars at 430am as my guide picked me up in the dark for the two hour drive. Passing Toyota pickup trucks with goats and cows strapped into the back, passively watching the surrounding mountains as the sun comes up, all headed for the ancient capital of Nizwa. 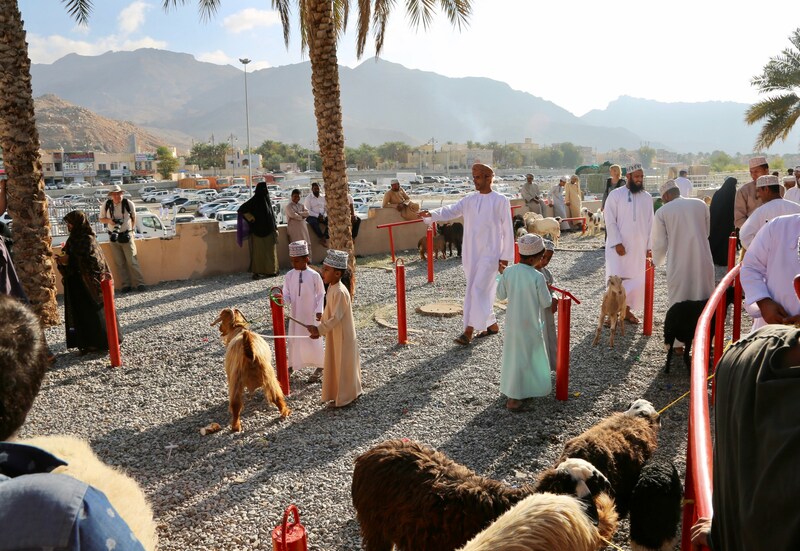 When you first pull up to the Friday morning souk in Nizwa, it’s a cacophony of sounds, sites and smells. The parking lot jammed with White Things. White cars. White robes. White buildings. In Oman, everything is white to reflect the intense sun. 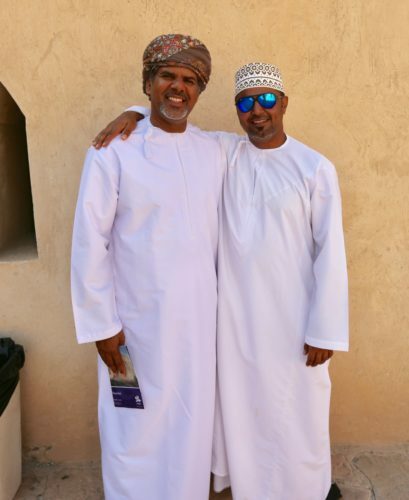 The ever present Omani cap, of every color and pattern, tight around their smiling faces, as everyone greets everyone, known or unknown, like a long lost brother. The Goat Action is fascinating to watch and its the Real Deal, you can really get right down in it.  Save for when swollen buses of retired German pensioners swarm the market for a 20 minute photo opp, clogging the scene with their cameras in faces. But once they’re off, everything returns to normal, as it has been done for hundreds of years. There’s so much going on in this scene… I love it. The way it works is: people bring their animals to sell and tie them up on the edge of the market. In the center is a raised platform, Omani men and women make concentric circles outward, leaving an open path for the animals to parade around the circle. Designated men are the auctioneers, negotiating an asking price with the owner, then taking each animal by rope and leading them around the circle, bellowing for bids. Lots of shouting and movement and the next goat isn’t far behind, butting for a higher bid. Men in white dishdasa and Omani caps of every color and pattern mill about — this is there everyday wear, not just some tourist show. Like moving marble columns, their shuffling legs hidden beneath their long white robes. The ever present Omani cap, of every color and pattern, tight around their smiling faces, as everyone greets everyone, known or unknown, like a long lost brother. I tried my best to stay back, a tourist myself, shooting over the bouquet of Omani caps. A few times I was jostled and nudged; annoyed, I turned around and realized it was just a goat at my feet, trying to enter the ring. This is Oman, I forget that nobody is ever rude or cross. People don’t even honk! If someone is interested they flag the main man, feel the goat’s haunches, check his teeth, feel their coats. Then seal the deal with cash in hand right there. The baby goats fetch the highest, prized for their tender meat, saved for special for celebrations. The rest go back to farms, perhaps for milk, perhaps to strengthen the herd. The indigo masks are striking and go back thousands of years, when the indigo dye color was one of the most expensive in the worlds. These are totally distinctive from the abayas I’ve seen elsewhere. And totally alluring. I watched this beautiful women with the finest fabrics participate in the bidding, go up and ask questions about a particular sheep, etc. She seemed to rule her house. The Goat Action is fascinating to watch and its the Real Deal, you can really get right down in it. Save for when swollen buses of retired German pensioners swarm the market for a 20 minute photo opp, clogging the scene with their cameras in faces. But once they’re off, everything returns to normal, as it has been done for hundreds of years. After the goats come the cattle. Same ritual, but the ring gets a lot wider as the bucking horned steers and cows made their displeasure known as they were coaxed and dragged by rope around the ring. Later, in the parking lot, the process was reversed. New owners smiling proudly of their purchase, kids holding goat kids in their arms as they loaded their Toyotas and funneled through the traffic on their way back home. Next to the Goat Market is the Nizwa Souk, which has different markets for everything one needs in the mountainous desert. A bird market. Seafood market. Produce market. Even a guns and knives market. The Goat Action in Nizwa was cool, but this was the thing I was most excited to see. Nizwa Fort. First, the fort was built on top of several forts dating back to the 12th Century. As spears and arrows led to guns and canons, they made it stronger. It really is any aesthetically beautiful fort, stunning. And the light throughout the day moves the shadows like a sundial. And now, it is only marauded by tour buses. Get out the boiling honey! The fort was built above an underground stream, with deep wells from the top going all the way down, to prevent enemies fowling the water. On top, the 360 views weren’t just pretty but they prevented a surprise attack, with 24 cannons ringing in all directions, and parapets for shooters to, you know, shoot. On top, the 360 views weren’t just pretty but they prevented a surprise attack, with 24 cannons ringing in all directions, and parapets for shooters to, you know, shoot. 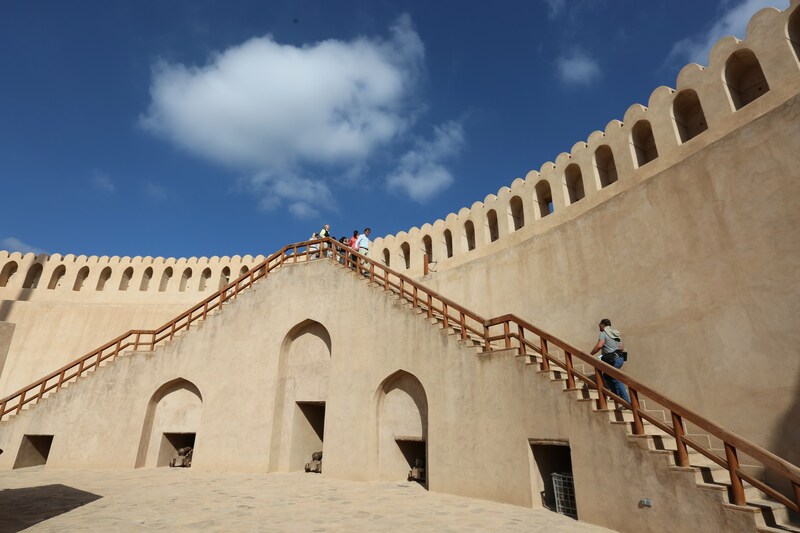 Here you can see how the big cylinder of the fort is loaded with stones — to be able to withstand canon fire — with the narrow staircase and its trapdoors piercing through. Those humpy points on the top of fortifications are an Omani thing, dating back to these forts when they used to shoot arrows and pour hot date honey on the marauders underneath. oooh-oooh ahhh-ahhhh. You see them everywhere now as a design element on a lot of Omani buildings. Banks. Ministries. Houses. Coffeeshops. This is called Banana Valley. Used to be mostly banana trees, but over time the profilic date palms took over, allowing shade to cover the banana trees below. Now it is a fashionable neighborhood, with houses nestled in between all the palms. Dates for days. Near Nizwa, Oman. This was really special to see. This is Oman’s first mosque. 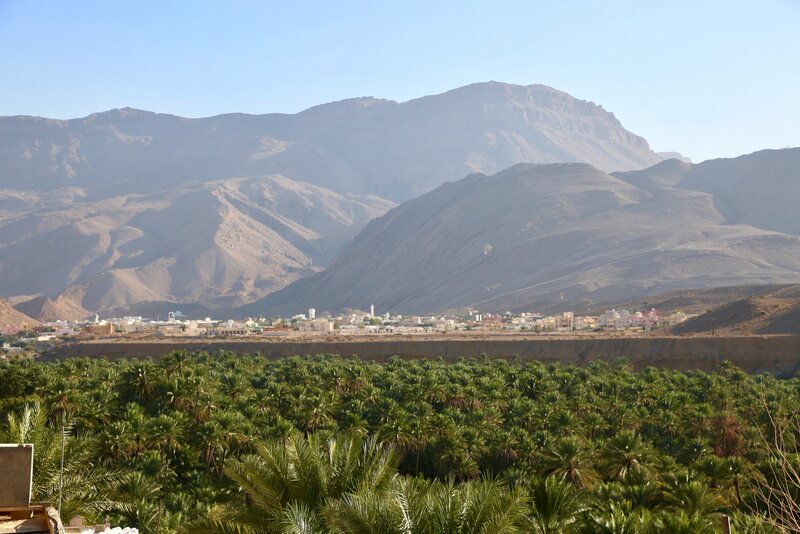 Islam was not always in Oman, but it started in Nizwa first, then spread across the country. You can visit this place and listen to the roaring falaj irrigation chutes slurping water down a chute. The holes allow people to wash their feet before entering the mosque. So. All that stuff I’ve posted above since I left Muscat occurred between a Thursday morning at 8 and Friday noon. That’s a ton of stuff in a short amount of time, but really didn’t feel like a bus tour — although I missed out of valuable time at the tent camp due to poor timing. 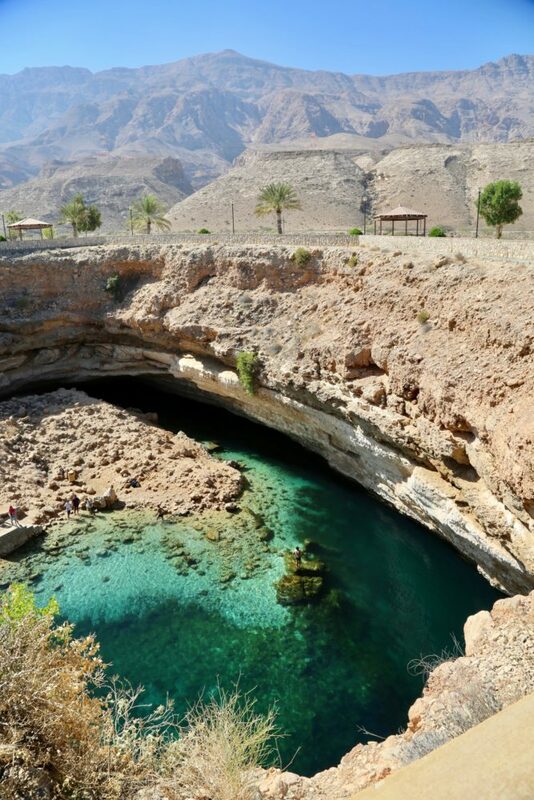 That’s what’s so awesome about Oman. Everything is so compact. Desert. Beaches. Mountains. Canyons. Spotless cities. Ancient towns. Amazing history, food & culture. All in a very compact space. 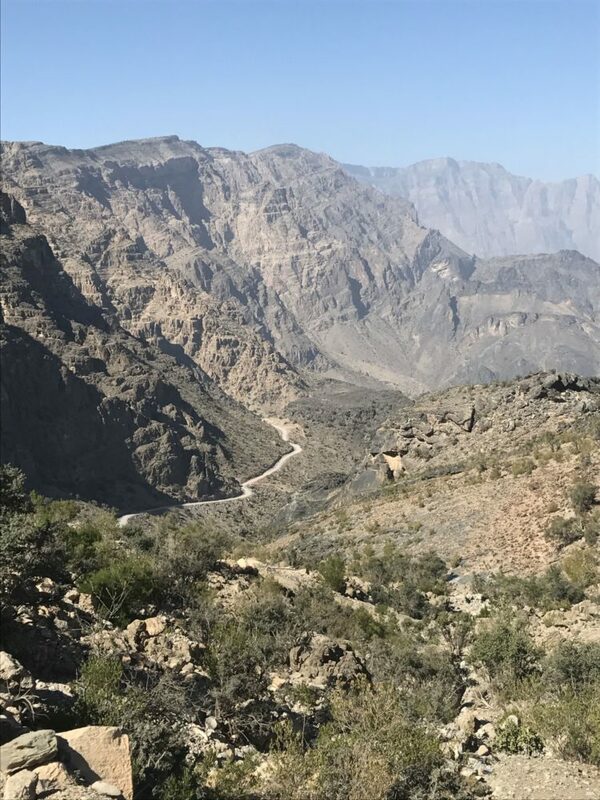 Continuing on after my overnight in the desert and Nizwa, the Circular Route heads into the Al Hajar mountain range, the gnarly canyons and arid mountains that cross the top of Oman. And that’s how this whole trip got started. (Even though I actually booked it on a lark of timing only the week before.) 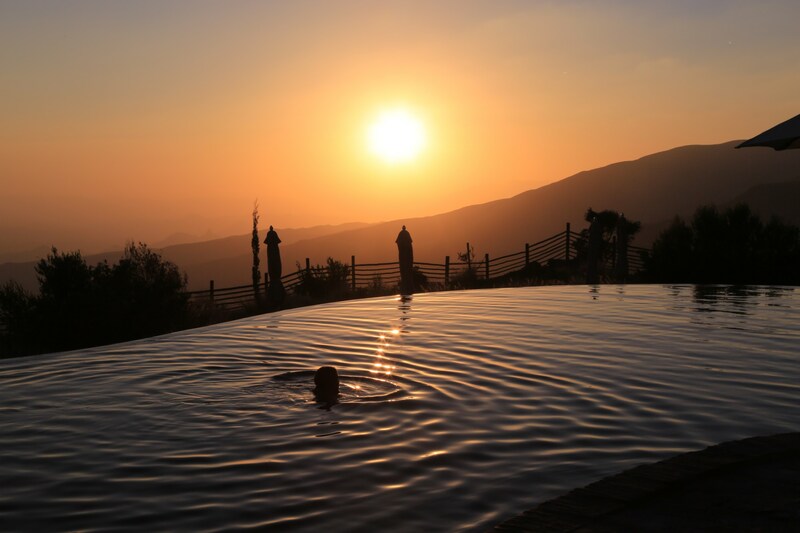 This is the famous Alila Jabal Akhdar one of the best luxury and adventure hotel chains in the world. 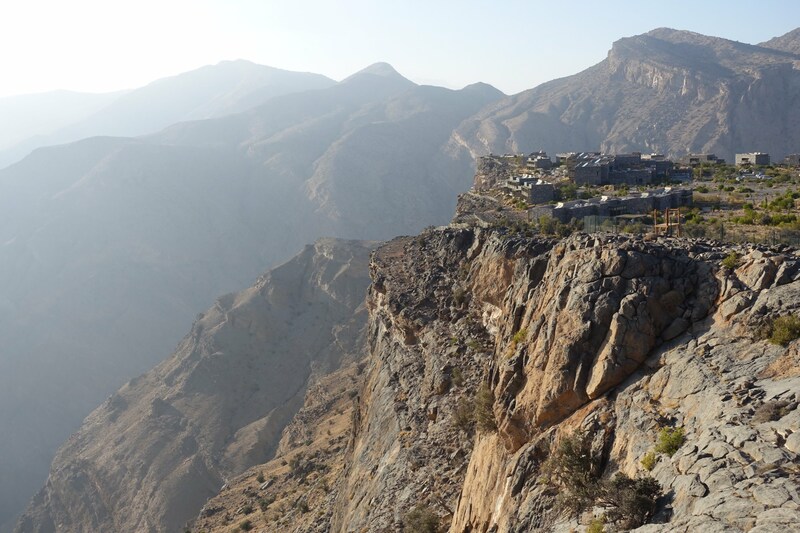 Sultan Qaboos decided that — as opposed to Dubai — Oman’s future without oil would be built on sustainable adventure tourism. And that’s how they got this amazing location. Omanis are proud of their country and they put this right here to show you it. …. because you can pretty much hit me over the head with it because I’m pretty much done here folks. . You’ll read and see a lot more about this place in an upcoming post. After four nights at the Alila, it was time to return to Muscat for the next phases of this two week Odyssey. You can take one of the main new highways that Sultan Qaboos has built for his people, which will whisk you to Muscat in no time as most shortened tours do on The Circular Route. 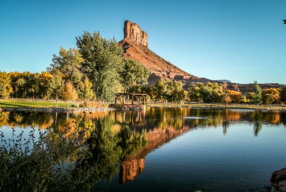 Or you can take the scenic route, picking your way through the steeps valleys and oasis towns along the famed Mountain Road. It takes about four hours, with stops along the way, but the scenery is something else. I love places where you can see the earth forming before your eyes. You can see the quality of the bumpy dirt road zigzagging through the valley. Some natural springs create oases and some feed crops and villages. But most of the water comes from Muscat. Desalinated and sent to far-off cities in deep underground water pipes. I can’t imagine the cost to do that. In the most remote places, water’s trucked in, in big blue water trucks that you see everywhere you drive. Water and electricity are not a luxury, but a right. The whole country is Impressively Electrified, with big red and white towers marching over every hill and craggy valley, no matter how remote. I meeeeaaaannn, look at this, it looks like someone split open the earth’s belly and you can see all its guts and inner workings! While driving through all these bouncy roads, I had to get my bearings. Called up Google maps to see what was around me. Take a look! Holy cow. [Double- or Triple-click on this photo so you can zoom in on this radical moonscape.] — I mean, just look how gnarly these mountains are, rolling down to the flat dry plains before the sea. When you’re in them, driving the zigzag dusty roads, you feel like the earth has split open and you’re looking at its innards. How cool is this fort?? 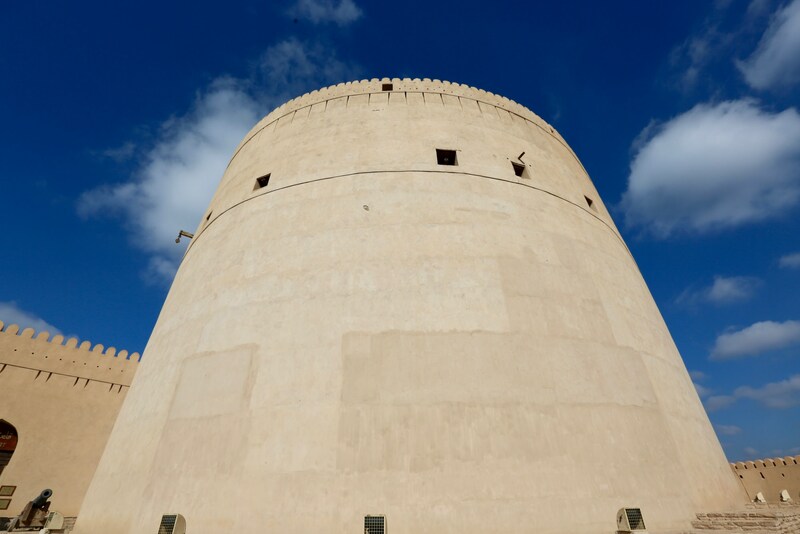 Nakhal Fort about 120 kilometers west of Muscat is one of Oman’s oldest, dating back 1,500 years. It was to protect the rough  trade route that snaked through those gnarly Hajar mountains. Very cool fort, looking like an M.C. Escher etching, all up-and-downy. Sometimes it is jammed with peeps, but when I was there mid-day it was just me and one other guy. I mean, look at these crazy stairs. Maaan, if I was being attacked, I’d be going up and down the wrong ones all the time, my helmet falling off, dropping my spear, spilling hot honey on my sandals… “DOH, it’s the other stair!” I still have nightmares about it… It does look like that famous MC Escher waterfall/stair etching, doesn’t it? You know… the one where you can’t tell where one ends and the other begins? I drew that in Art class once when I was a kid, with smudgy graphite all over the paper. The first nice thing I ever drew. My mom framed it. For 1,500 years this view has been here. 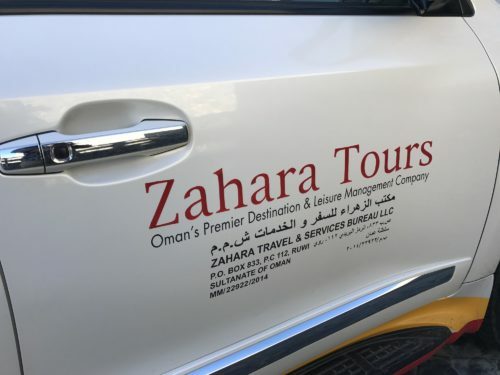 If you need ground logistics in Oman you should look at Zahara Tours for all your guide work and arrangements. They are the kings of guides and logistics tours in Oman, they are everywhere, know everybody and have infinite resources. No matter where you go, you see their guides taking peeps around. You can certainly drive yourself, the roads are fine, its the safest country in the world and all signs are marked in Arabic and English, but having that local knowledge makes everything so much more efficient vs. wasting time going round-and-round the roundabout all day.  And you should definitely rent a 4WD to get where the getting is good. Hamed and Zubir. The best. I had about five different guides from Zahara throughout the two weeks and they were all great, but these two were amazing. Hamed and Zubir. So funny that both happened to be in the Nizwa Fort at the same time so I can get a photo of them together. But that shows how these guys are all over the country, everywhere we went they knew all the people, history and insider knowledge. And to go where everybody else isn’t. Highly recommend. Flawless, not a single hiccup during my whole time scooting all over the place. Some tour agencies have what they call a “two-two-two” route they take people one to hit all the highlights. But really there’s so much to see in each place, I went for two weeks and felt like I barely scratched the surface. I used Scott Dunn Travel to book my entire trip and they were amazing. They have a fantastic website that has tons of pictures and details and different itineraries for what you’re in the mood for. 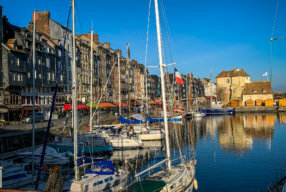 I wasted a year and a half trying to book through another well-known British travel company and they kept giving the run-around, or forcing me into a fixed two-two-two trip — which would have been a total waste. I swear, I spent half an hour on the phone with Louise Brooks and just got exactly what I wanted, full detailed two week itinerary in half a day. Easiest vacation I ever planned, a full two week trip planned in half a day, bought and then I left the following week! (DM me if you want my agent’s contacts).